On the Bright Side of the Bones? I'm back to writing a normal Star Wars post. Sorta... I'm relating it to something. I have yet to see today's episode. I'm going to watch it at dinner. So, I had this thought today to look on the bright side of things. Like, looking at the Onderon arc. If anything that I really hated happened... it was that Steela (or Steal-A-Boyfriend, as I call her) kissed Lux. But we all know what happened to her in the end. The one thing I've realized I can look on the bright side of, is that Ahsoka did have some deep feelings for Lux. And I have proof, although I won't be posting pictures of everything. Ahsoka clearly seemed happy for Lux when Steela kissed him, but what I've learned is you can be very happy for someone, and yet feel very sad by the same thing. I almost feel like my favorite Clone Wars characters have been thrust into Bones(The TV show)! I don't know how many people WATCH it, but if you're not up to date on the 6th season and you'd rather not have spoilers, you'll wanna skip a few paragraphs, although this IS key to my post. **Bones and Booth apparently had or thought about a relationship before the 6th season (I'm nit quite sure, I haven't seen the 5th season). I know they used to feel like they were on opisate sides and very incompatable, like Lux and Ahsoka. But as the series progresses (Fast forward to end of 5th season), they have grown very close, but are both leaving. Yet, they promise to meet again. (Now at 6th season) When they do, Booth has met another woman (Sounds familar, huh?). Bones insists she's happy for him, while it's clear she's still sad, up until later in the season when the break up (pretend she died) and Booth's devistated. ** That's about what happened in TCW, right? 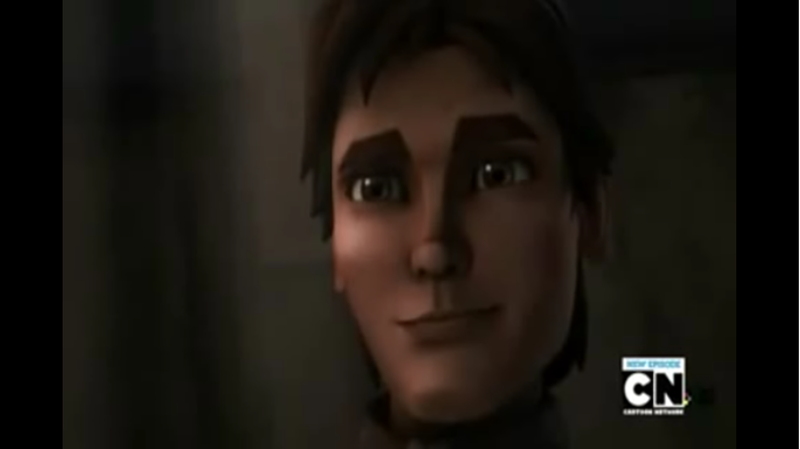 I high doubt what happens in the season final will happen in the Clone Wars series, because that would totally freak me out! **(Bones finds out she's pregnant). ** Anyway, if it's anything like what's happening in Bones, I'd be very pleased with the outcome. However, this is Star Wars, and their very unpredictable. But I thought the way it's been going is quite interesting. 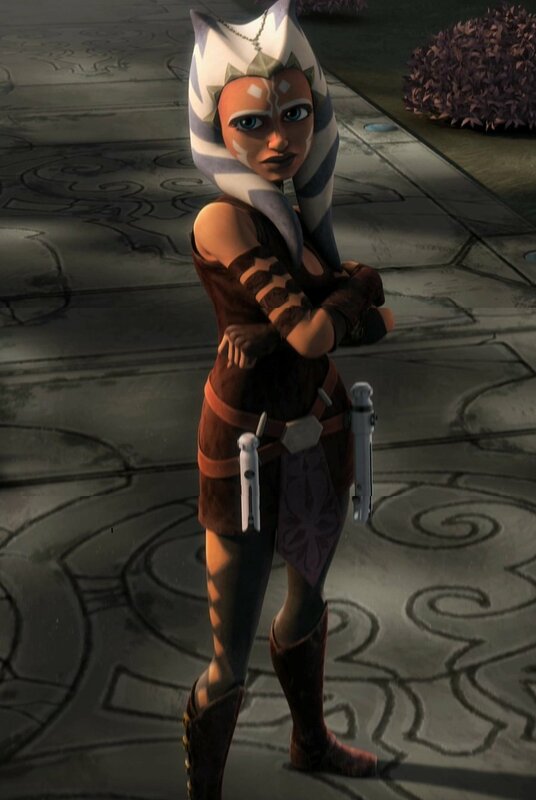 Although things appear dim, there's still a chance for Luxsoka! From so along ago, when they first met. Okay... I'm thinking I may know why Lux likes Steela. 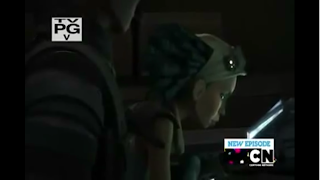 Let's compare her to the young Padawan he first kissed, shall we? 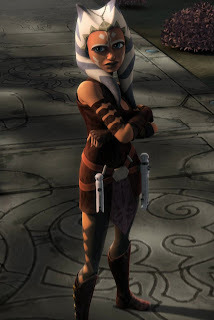 I can't be the ONLY person who noticed this... She has fingerless, elbow-length gloves, knee-high boots, a belt that has for straps and a buckle with a similar shape to Ahsoka's. Sleeveless top, similar body shape, something around her neck... weird hair. I know Ahsoka's isn't really HAIR, it's lekku and monterials. Still, I have more similarities. There's a pouch on the back of her belt, something around the top of her head, her boots have the part that comes down around the arch... I really don't need to go on. 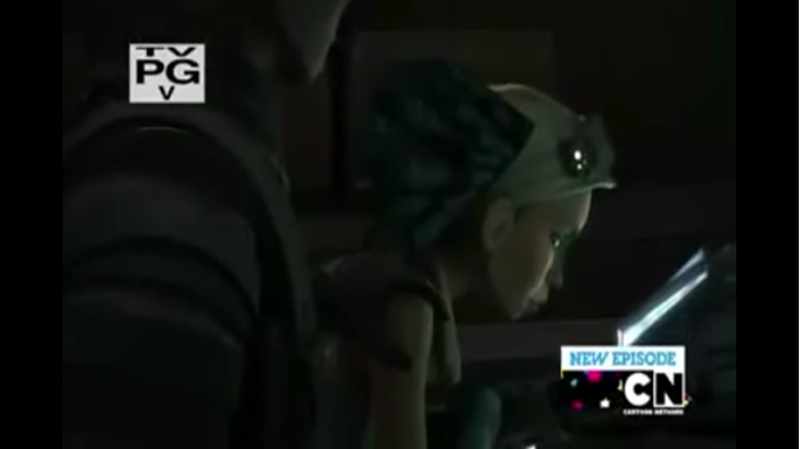 Basically, Steela looks a lot like Ahsoka and I think that was done purposely. Really, please tell me I'm not the only one. The only reason I waited so long, was in hopes someone else would make the connection and I could hear their thoughts before I posted and people told me otherwise. What do you think? WARNING: This post contains spoilers from the Onderon episodes and Season Five!!! ...To sum up something in a single, excited and horrifying re-accruing word that I want to see next season? Lux. Now, I don't mean that in a bad way at all, hear me through. It may be a little early, or right on time, but I have to see where his story ends. It's the only one, besides Ahsoka's, I'm really anticipating. I don't really like Darth Maul or Ventress as much as I do the other two, not to say I'd rather not hear their stories, because I would, but I'm just not as found of these Dark side duelists. And it's not like I had become immediately attached to Maul and Ventress like I had Lux and Ahsoka. 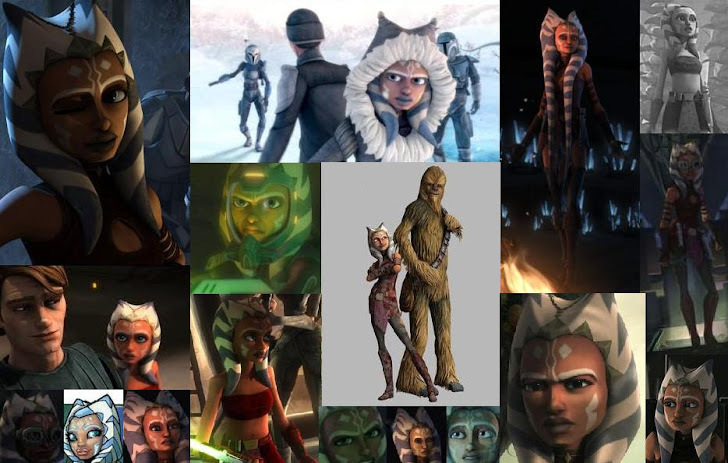 Lux and Ahsoka were instantly a piece of the Star Wars universe as soon as they were created. Most people don't recognize that. And I'm just not ready to see them collapse under the pressure of war. I want a story that leads them beyond what you already know, into secrets and shadows. And Lux can do that. 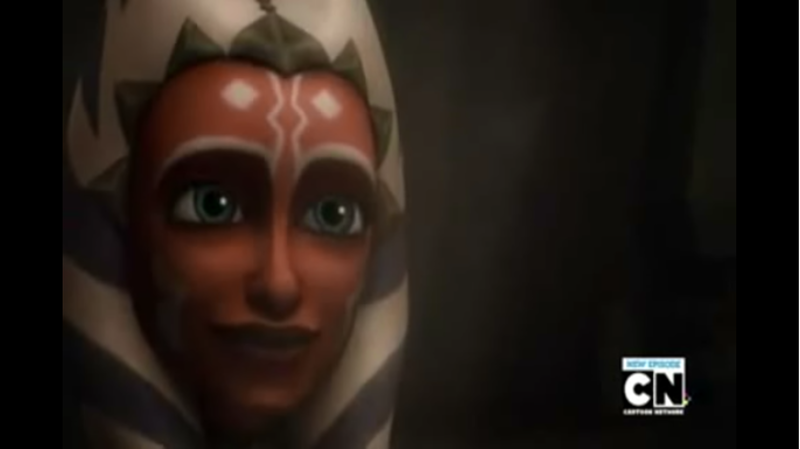 I know that if he's going to be in an episode, Ahsoka will be too. And now that he'll be joining the Republic, what's to say there won't be more of him? The story of the Padawan and the Senator who discovered so much after one fateful event. Steela, I honestly felt so terrible about. She had gotten on and off my nerves throughout the arc, flirting and breaking into moments where I would just like to have two of my favorite characters talk. Especially after the advents of A Friend in Need. 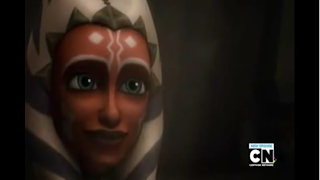 It felt unfair for those who had waited for a one-on-one discussing between Lux and Ahsoka to happen, to have Steela barge in and throw the two off the track. And when I had actually said to my friend, "I wish she was out of the picture!" And threatened to drive a butter knife through her body if she interrupted another conversation between them (I later used this to my advantage by tricking my friend into believing I had actually drove a knife through the screen of my computer, making her response nearly impossible to watch). 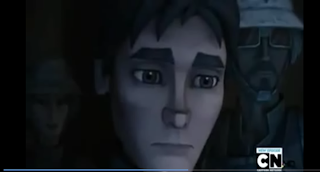 When I had said that, I did not mean under any circumstances for Dave Filoni to kill her! I cried when she died, and as a writer myself, I could see her character potential and all that was wasted when she fell off the cliff. Saw... another interesting character. I actually liked him more than his sister. In the end, I wasn't, and still am not, certain where his path lies. I hope that Dave brings him back again. I like Luxsoka, I don't care if you say it's stupid and Ahsoka needs not to fall in love. Think of it this way: Like Master, like Padawan. If Anakin hadn't of fallen in love, there would be no Star Wars. And then where would the Galaxy be without Luke and Leia? Jedi should be entitled to fall in love or have a relationship, choosing on their own weather it should end or endure. If someone told you that you weren't allowed to get married because you are a member of something, what would you do? I'm not calling other people wrong. If you don't believe in Luxsoka, happen to like Rexsoka or Cadsoka, or still think all Jedi need to follow the code, it's fine. I deal with all four every day. I have a friend who doesn't like Jedi relationships, another who doesn't think Ahsoka should be in love, two who like Rexsoka and one who's always giggling on how cute Cadsoka is. I really don't care how you believe in my favorite Padawan, but I still wonder why people hate her. If the haters even watch the show, they have to know how much Ahsoka affected the galaxy. Without her, things would be very different in the Original Trilogy, believe you me. Had she never been created, things, I suppose, would have stayed the same. But the explanation would be very different. They would be different to me. To my friends. To the haters, who would have found another way to hate. To the Fan Fiction authors. To artists. And most of all to the Chosen One. Where would we be without Darth Vader? Now maybe I've done a bunny trail. I've gone from one thing to another and then another and so forth. In my reality all things in this post are connected in some way, and like a conversation, it switches subjects. I wasn't even planning on making this into a blog post, I was simply typing out a few words on Facebook. That expanded and I felt I needed to post this where others could see. Just try to learn something from my bunny trail. I'd hate for it to be in vain. People laugh because I'm different. I laugh because all of them are the same. This post makes me unique. Leaving you with this thought: Be careful what you wish for, it effects everything. THIS POST CONTAINS PICTURES I MADE. PLEASE DON'T STEAL. The episode was very good. I was getting a little aggravated by Steela again when she basically pushed Lux away, but then I almost cried and felt sorry for Lux when Ahsoka said, "Purpose must come before feelings." I think he didn't realize Ahsoka liked him back and he felt he needed to move on. "Purpose must come before feelings." 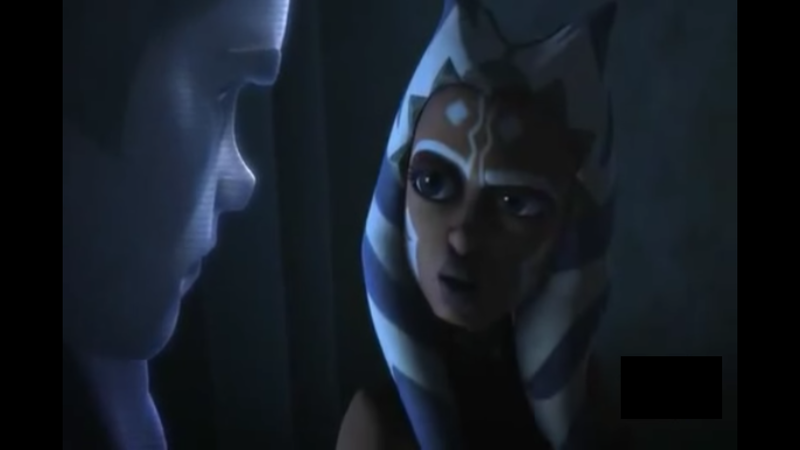 "Ahsoka.... I knew you couldn't resist a good fight." "Am I becoming that predictable?" 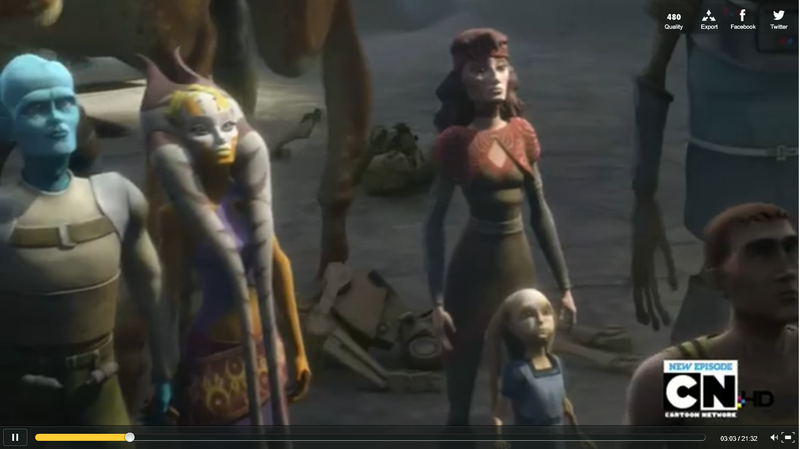 And if you look closly, you can see a Togruta and a Twi'lek holding hands... A Message from Dave Filoni maybe?? A Togruta and a Twi'lek? Anoka: "It was crazy... Nothing I would change about the end, I liked it. 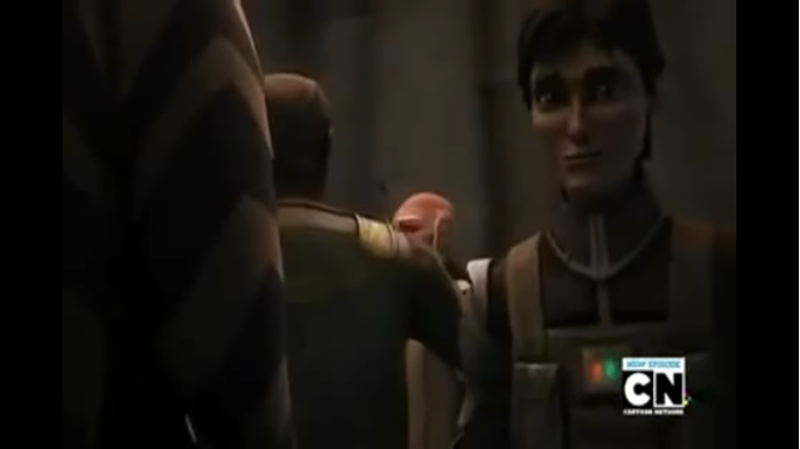 When he was flirting with Steela, I thought that wasn't right and it made me feel mad because Ahsoka liked him and he liked her and he was flirting with another GIRL!" Please forgive the post-less months of pain without Star Wars to fill our emptiness I have created, but my internet has been down for some time, and as I had hoped for it to return, I neglected my poor little blog. ;) Anyway, since it still hasn’t returned, I’m currently only able to post once a week, if that. I’ll try not to be such an annoying blogger to the blog-ee. 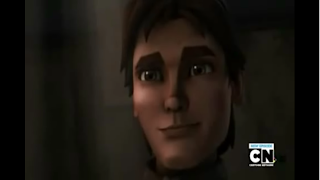 Anyway, in the latest of Clone Wars episodes, I found myself pondering the way Anakin’s mind works in giving (“Good”) advice. Since Lux Bonteri’s return, Ahsoka has been startlingly distracted and jealous from his relationship-friendship with Steela Gerrera. When Anakin approached her about losing focus in A War on Two Fronts, she completely denied it. However, he quickly discovers the source by the end of the episode by only two words: “You too”. His obvious suggestion by the later part of Front Runners, after Ahsoka’s irritation and disappointment can be spotted, is for her to entrap, cap and conceal her feelings to regain focus on the situation. Nothing a typical Master would have said. In Season One, when Ahsoka’s attachment to Anakin was over prominent, Aayla Secura basically told her to detach and destroy her sisterly feelings for her Master, along with stating she had to do it when she was young as well. Anakin did neither, in fact confessing that he was actually going through what she felt, even then. Who can forget the startled, accusing and confused face of the young Togruta? 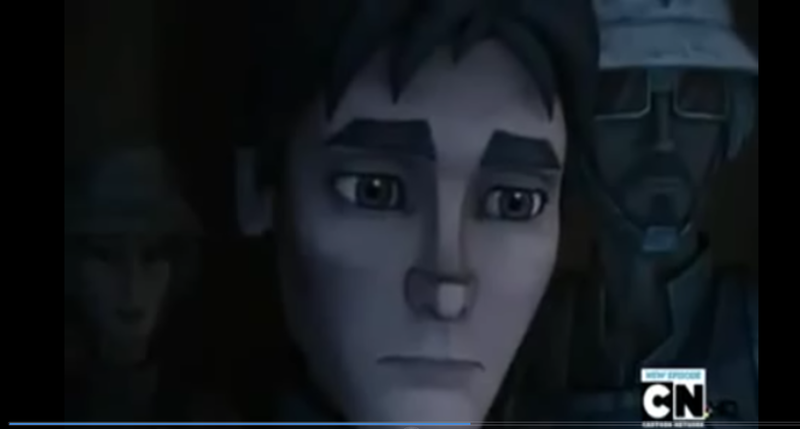 He’s also very paitent and concerned for Ahsoka while she’s in turmoil over her feelings. She’s very confused because she’s never had anything like this happen to her. Another good angle is what Dave is showing us. 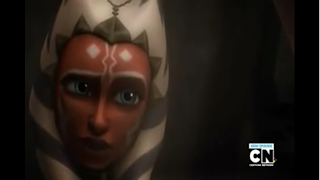 Ahsoka has become slightly irrational and bitter towards Steela, whom I may mention got on my nerves in the first episode, easily telling us why the Jedi are against attachment in the first place. It makes them mentally unbalanced and unsure, not to mention the risks they take for the people they love (not always in a boyfriend-girlfriend or husband and wife way). Although I’ve always been pretty… wondrous at why they don’t allow them to be attached, these episodes put it in perspective and helped me understand. I’ve become well known in my friends and family for my knowledge of Star Wars and unique, adapting personality, but I’m only now beginning to grasp some of the Jedi beliefs and realize why they were so. When I follow the storyline of a Jedi or character that isn’t supposed to do something specific, but does, it’s very interesting to watch how it will play out. And these episodes are perfect for it. P.S. My niece, whom I call Barriss is with me! Tell her hi! ;) Barriss: hi i'm barriss. Okay, yes, I know I vanished again. I just wanted to wait and give the whole Prision Arc an overall, but I got... mildly sidetracked. Sorry I didn't write much on the Prision Arc. There just was more to say about Massacre. Not bad, I really liked them. Although, they kind of left us on edge. It was pretty good. Really funny, too. Okay, I thought that this wasn't going to be too bad. I never actually liked the Nightsisters from the beginning, so I just watched the episodes once and practicly left it at that. But honestly, the "baptism" really made me feel that they were making Christains, like me, bad guys. People might believe that this is the way Christains are if they're not going to church. Now, I set that aside and tried to let it go, but when that chant started, I felt my stomach churn. When I saw those zombie-like creatures, my jaw dropped. Sure they had zombies in season two, but they didn't look much different or have skin hanging off their body. In fact, they weren't actually zombies, just dead bugs controled by worms. But when they started acting like mindless creatures, I felt like leaving the page I was watching the episode on. That only got stronger when Mother Talzin made that voodo doll. I have always opposed witchcraft. The fact that anytime a Nightsister chanted, their eyes rolled back in their head really annoyed me. There are children, like my neice and nephew, that actually watch this show. I refused to let my neice watch the season two zombies because she is afraid of everything. I'm not letting her watch this episode for a few years, maybe not even then. On the bright side, I found myself feeling mildly sorry for Ventress and a few of the Nightsisters. Most of them wouldn't have had a choice, they were born into the Nightsisters and it's probably the only home they've ever known. Grievous actually had a more... Revenge of the Sith style walk. More hunched over and different-sounding footsteps. I also was somewhat happy with the turnout of this episode. It was... okay. Well, that's what I have to say. Maybe 2 or 3 out of 10. I found it hard to get past the howling, almost rabid-looking zombies and evil voodo, not to even go back into the "baptism". Well, May the Force be with you. Next week's looks better.